Tewsday's Blog | Living a life filled with Cats and Rainbows. Living a life filled with Cats and Rainbows. Being a Crazy Cat Lady who loves her fashion has never been better! There are so many handmade and fashion brands out there, Including Frilly Pops (pictured), who are embracing the love of cats and Hello Kitty! Well hello, 2019, and what a great time to embrace your Crazy Cat Person to full potential. I have never really hidden my love of felines and right now, the fashion world is helping me build on my purrrsonal style even more. One of my favourite brands for jewellery and of course their quirky shoes is Irregular Choice. If I am short on anything quirky and cute, I know I can rely on this brilliant British brand. My most recent purchase from them comes in the form of the Lucky Cat Earrings. These were a steal at £10, and the majority of their jewellery is around this price point, so compared to their shoes which as beautiful as they are, can be around £100, this is a great entry level price point into the brand. Also, you can always rely on Etsy and your local makers market to fill your love of kittehs. 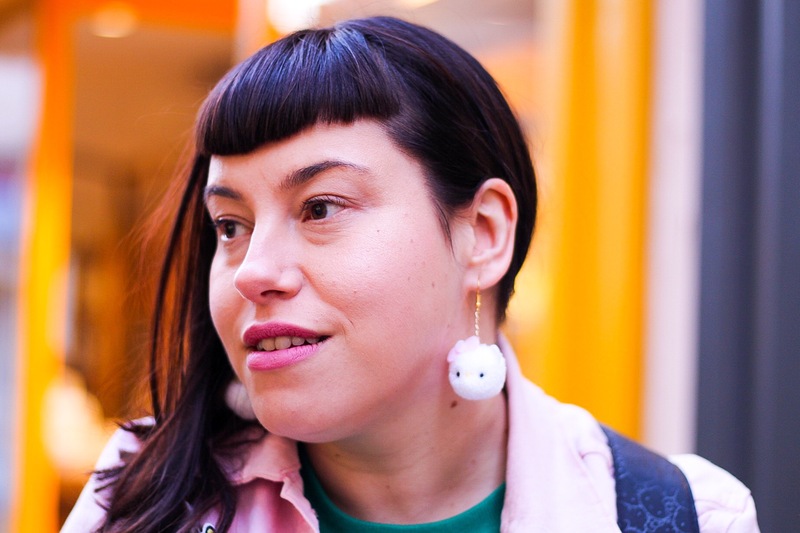 One of my favourite local cat loving ladies is Miss Ella, whos love of cats can be found in jewellery, art and even city murals in my home town of Norwich! The two handmade brooches I’m wearing in the picture above are what I have collected and been given over the years. There are so many amazingly creative people out there embracing their love of cats. My other favourites being Sugar and Sloth and for cute pompom cats, it must be Frilly Pop Shop. So what are you waiting for, crazy cat gang?! Get out there and embrace your Crazy Cat styles! So if you have been hiding under a rock the past year (or dare I say it, not a Hello Kitty fan) you may of missed some of the amazing Hello Kitty collabs! Really we need to go back to just before the end of 2017 when it kicked off. This was of course ASOS’s first collection with the purrfect Miss Kitty herself! The first array was more geared to Christmas and party wear, the prices ranging from £5 to £95. There was some amazing buys, but the downside to me was the amount of Dabbing Hello Kitty’s. I do not buy into this fad, thank you! Though I did purchase some of the jewellery and handbags. The hoop earrings were my all time favourite, and the most amazing handbags, I purchased both the white fluffy crossover and the very similar Charlotte Olympia Olympia style black backpack. We then of course had the the big hype of PumaXHelloKitty which celebrated the more classic OG style. Red and white, classic and clean! This connection was HOT, and sold out pretty quickly. To be honest I didn’t even think I’d get a pair in the UK, but thankfully Schuh had my back and I got my precious pair! Now these were expensive to me £80 for a pair of trainers is not a lot to some people, but to me they were A LOT! Though they were worth every penny for the cuteness factor! When Summer came it was time for ASOS to bring a new selection of goodies. This had 90s vibes and quirky girly feels. I found the collection a little bit too young for me, but the bow heels and ankle socks were my prize wear of the summer. The shoes in particular stole the show at a summer party! Now the latest and most hyped so far has to go to ConverseXHelloKitty. This range had a huge selection of colours and styles, even including clothes. This one, I had to be held back on a bit! 3 pairs of shoes and a t shirt later, I was one happy Kitty! The collection was so popular, styles sold out in a day and I had to wait a while to get them via Converse. Though when they came, they were stunning, so beautiful in fact I still haven’t dared wear them yet! There have also been some extremely high end collections what have happened with the likes of Furla, Pinko and Chinti and Parker, which I have loved, but are way out of my price range! What is next for the Hello Kitty collabs?! I would like to see more UK brands bring back the Kitty Queen, especially clothing in plus size. We miss out on lots of cool brands in the UK like Loungefly, who do some amazing Hello Kitty accessories, but don’t stock in the UK. Sanrio themselves do not have a UK site. So hopefully 2019 we may finally get all the Hello Kitty we love and deserve! I am sure any true Hello Kitty fan out there is aware of these awesome little Loot Crates. I know I have been going crazy for them for over a year, but the price always puts me off slightly. At £39 it’s a high price for a gamble on what will be inside 🙀. I purchased my first box due a coupon with 20% off, and as I had some birthday money I thought I’d treat myself. Being that I’m in England, this took a long time to come! Sweet Dreams was cute as a button. It ticked all the boxes! Pastel colours, more Hello Kitty and items I would use! To conclude, I am carrying on with the Loot crates. They come only 4 times a year, and at the moment I am really enjoying them. What do you guys think? Have you had the the Hello Kitty Loot Crate, or any other suprise box? Let me know what you think, or if there is any other cute boxes I should get. London, beautiful London. 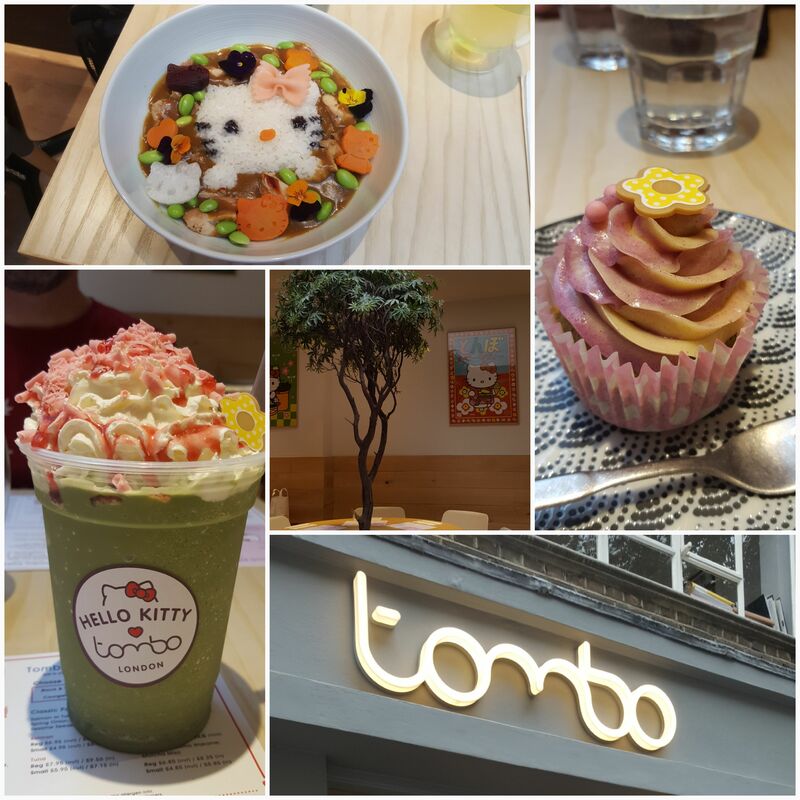 I always knew you wouldn’t let me down, and this month you have given me the Joy of the Tombo x Hello Kitty collaboration at their Fitzrovia location. All the Japanese treats a Hello Kitty fan could desire, and what purrrfect timing being it’s my birthday month! So, with my faithful and kind husband beside me we ventured to the big smoke for some Hello Kitty fun. 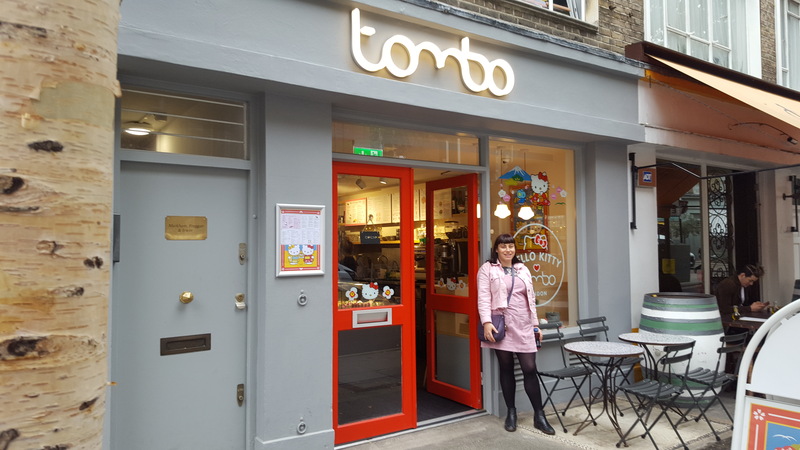 The great thing about Tombo Fitzrovia is it isn’t hard to find. Just get off the tube at Tottenham Court Road and head up past the Dominion theatre and you will find it a few streets up on your left. So excited to be there! Tombo itself is quite a small Japanese café with nice clean décor. We were greeted with traditional styled pictures of Hello Kitty in many Japanese poses and locations, my excitement was a little bit more intense than the rest of the customers, I even dressed up in my favourite HK items! The staff were friendly and directed us to a table, we got there about 11.45am which was the perfect time, as by the time we left the place it was getting full, and I didn’t want to chance missing the HK goodies! 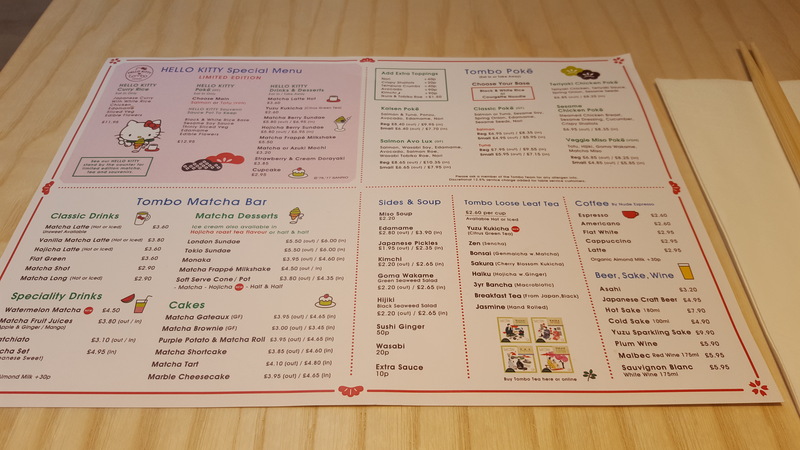 So, the menu has a section dedicated to Hello Kitty inspired dishes including, Hello Kitty curry rice (a Hello Kitty katsu curry inspiration) and a Hello Kitty poké. There is also a selection of matcha inspired drinks and a nice selection of HK desserts to choose from. Today was a day of firsts, I have never tried poké what Tombo is famous for, or the wide range of matcha products. I have only ever had matcha in a green tea. This place you get Matcha in EVERYTHING! 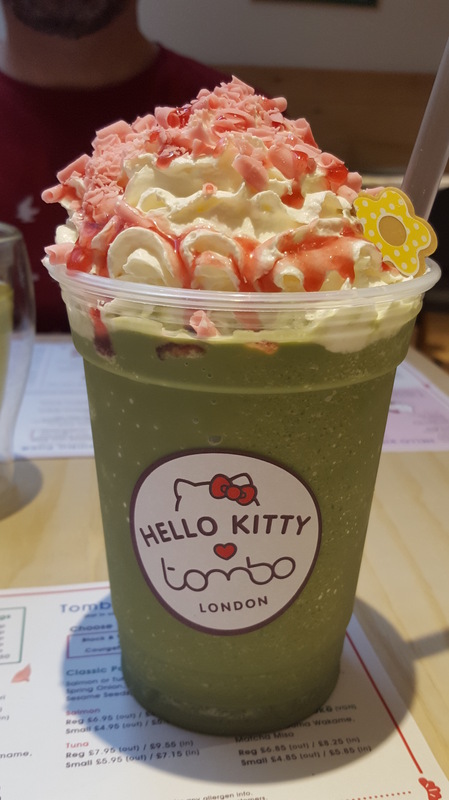 I chose a Hello Kitty matcha frappuccino, the green concoction came topped with whipped cream, strawberry sauce, and grated pink chocolate. I was hoping for a Hello Kitty popped on the side of the cream like I saw on pictures of the sundae so I was a little disappointed, but it still tasted and looked good. Being that I have never had any kind of tea frappe it was an interesting taste. I feel it is a drink I could get use to the more I had it. My husband had the yuza kukicha citrus green tea, which was beautiful and fresh tasting, so much so I brought the Hello Kitty special edition pouch. As you can see I am all decked out in Hello Kitty for this! We chose a Hello Kitty curry rice and Hello Kitty salmon Poké. (Bonus on purchasing the Poké is you get a mini soy sauce Hello Kitty bottle to take away with you!) I have never had Poké before, so I chose to opt for this, also by doing this we both got to try a bit of each other’s. As you can see from the pictures, the food was beautifully decorated, to the point I didn’t want to destroy her beautiful face. Poké is a really refreshing light Japanese style salad, and the HK special even had tiny HK’s out of carrot and beetroot dotted about the bowl. The curry was just as pretty with her little face poking out of a bowl of delicious katsu curry and like my poké it had little HK carrots and beetroot shapes around the bowl. The katsu curry had a nice taste, one of the best I have tried in a long time. 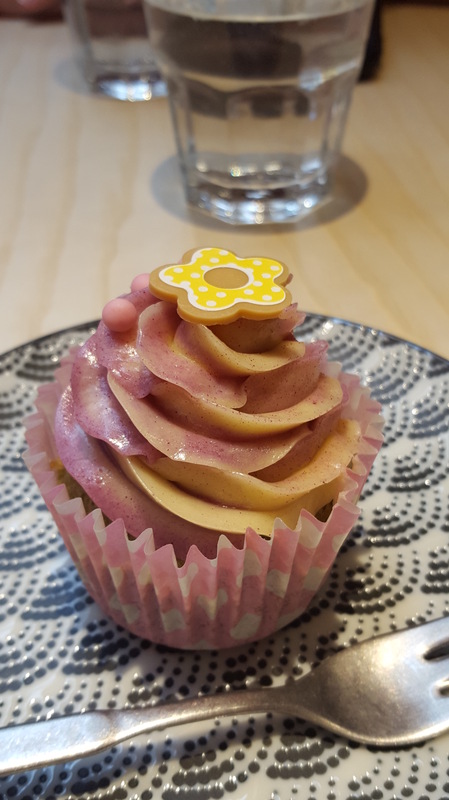 For dessert, I had a little Hello Kitty cupcake, once again like the Frappa this was also lacking Hello Kitty items on it. All it needed was a little icing Hello Kitty to set it off and make it a bit more special. Overall, I really enjoyed Tombo, I would have never known about this place if it wasn’t for the Hello Kitty pop up. Would I go again without the Hello Kitty pop up? Yes! It has a nice feel and the food is fresh. 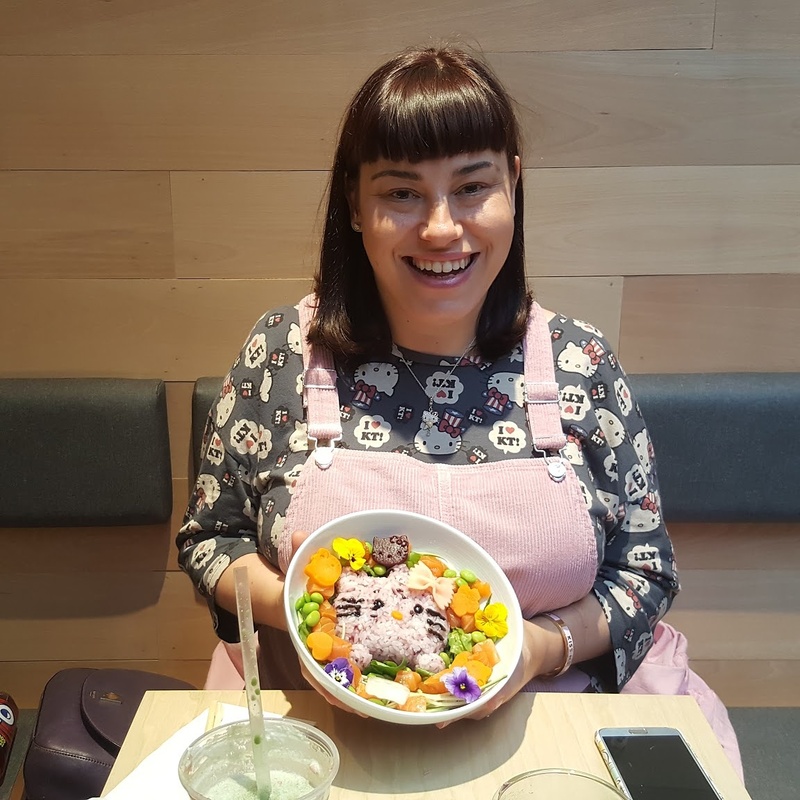 The Matcha Frappuccino wasn’t really my thing, but I could easily enjoy a pot of the lovely Yuza Kukichia, and I can really see why Poké is making such a craze in London. Healthy, fresh, and delicious! If you are a crazy Hello Kitty fan, and want to try out Tombo x Hello Kitty, it is still on till 8th October! The one thing I have learnt since moving into the 30’s category of life is the more things I don’t give a flying hoot about, which always surprises me and makes me laugh. Even in a Snapchat filter I like me. The major mile stone must be the fact that I don’t hate the way I look in the mirror. Spending probably a good 20 years scrutinising my weight and looks, I finally have come to terms and acceptance of this. Of course, I would like to weigh less and remove those bloody bags under my eyes, but most of all I can look in the mirror and go, “You know what you don’t look half bad?”. Though it does offer up the question, are we allowed to like ourselves, even love without coming across arrogant and smug? It isn’t a particularly British characteristic, but why shouldn’t we feel happy to stand up and say that we feel beautiful the way we are and happy with our lives. I was discussing with a friend of mine how my mindset changed through my late 20’s to now (which you can see from older posts.). Before hitting 30 I gave it my all to get as much weight off as possible, hiring personal trainers and doing strict diets. It was all about getting as low as possible. I wanted to be in that mid heathy BMI and I knew the time was ticking. The 9 and half stone target never got reached, but I lost nearly 2 stone and felt miles better about myself. I look back on the pictures in Las Vegas for my 30th and I don’t look half bad. This of course as discussed with my friend happened due to slow changes. I found dieting harder, but I was enjoying life more. I started to like the gym for the exercise instead of a gruelling regime to lose copious amounts of weight before a set date. I now go to the gym, do my work out which I like and just have fun with it. Also, as much as I know I need to lose weight for health and longevity, I just really like my curves. I have given up on beating myself up on trying to get into Topshop’s tiny 16 and just enjoy shopping elsewhere. There are so much more fun and interesting options to find and explore, the internet has opened a wide world of options to all shapes and sizes. Asos caters for everyone and so does Missguided too. Why not try a spot of vintage? It can be hard to find in larger sizes, and sometimes what looks a bit scary on a hanger can look amazing with the right accessories. The Stylist and the Collector can show you just that. The truth is, I have found my groove let’s say. The way I have done this has been gradual and there are a few steps I have found. Getting a good haircut and colour – ban the boxes and just dig deep and pay the extra for a good cut and colour. The older we get the more care we need to take not just to our face and body, but our hair too (covering those pesky greys). I have now had the same style for over 3 years, it is now a signature look for me. People now expect me to rock my short fringe which I love, especially with a pair of funky sunglasses. Also, use a good shampoo and conditioner. If you are paying all this money for a good quality cut and colour, treat it right! Get rid of the high street and pay a bit more for deluxe shampoo and conditioners. Tigi Bedhead can be found in TK Maxx and and Justmylook does a brilliant price on the tween packs with free delivery! Don’t give a hoot about what you want to wear. Half the time I feel like I am dressing like a five-year-old, and I really don’t care. I have to stop myself sometimes buying something, just because it’s “cool” and it’s not me. I am a 33-year-old woman I don’t have to be reformed into some category which I should be in. I am old enough to not care and wear what the hell I want! Yes, that does mean a pastel leather mini skirt and a Pusheen t shirt. Go to the gym, Boogy bounce, spin or hot as hell bikram yoga, but do it because you like it, not because you feel you must. Most of all enjoy who you are and what you have to offer. Go out there and be fabulous because I am finding the 30s life just that. Last week was the celebration of my 33rd year on this planet we call Earth, and what may you ask have I accomplished over those years? Feeling not so like Taylor Swift at 33. Well apart from mentally being scared at school and living in a constant daydream, I have done many things I am extremely proud of and maybe not so. Life as always is a constant rollercoaster of highs, lows and straight lines. Though the past year I have made significant changes to my ride, with going back to school to retake my GCSE English. That alone meant opening and facing some serious demons and reminders I would like to forget. Though I made it through with an astounding A grade. (I still can’t quite get to grips with that!) I of course have always wanted to write and, I know people will scrutinise this and be like “How did she get an A in English, her writing is appalling.” Well #HatersGonnaHate at the end of the day and I am at the latter part of the Millennial clan, hashtags all the way. Talking about Millennials one of our main characters we all looked up to was Bridget Jones. I could really relate to the character when I was a 16-year-old chubby teenager who really didn’t feel like I fitted in anywhere. (Unlike now, you guys have so many positive role models.) Bridget gave me light and hope. I can still remember crying in the cinema when Daniel Cleaver’s skinny American girlfriend said these haunting lines “I thought you said she was thin.”. I wanted to punch through the screen, though the difference was Bridget still weighed less than me. I really thought that was how my life would turn out to be. Though of course it was far from the truth. At 33 years old, I may weigh around 12 st 4 pounds and only be 5ft 4 inches, I can confirm I do not smoke and I am not a spinster. I am married to the most amazing man in the whole world. Though like Bridget my weight plays on my mind, and that is one thing we both have in common. The scales are my enemy and food my false friend. Try to deal with my stupid underactive thyroid making my metabolism slower than a sloth crossing the road in Costa Rica. Try some crazy diets, and keep you all informed of my hate for them. Try to not bombard you with terrible before and after pictures, maybe of me attacking a Nando’s wing roulette challenge. But most of all, I will be a normal woman in her 30s, I don’t have a sponsor wanting me to make some bloody DVD, so I will show you like it is… HELL. So I look forward to keeping you entertained over the next few months of my struggle. Just remember guys we are all in this together. As you may have read in one of my last posts, I was unsure if I should go freeze in Leicester Square for god knows how many hours, or stay lovely and warm in my bed all day on my day off. As you probably have guessed from the title of this post, I chose to turn my body into a human Popsicle. Let me talk you through how one crazy 31 year old dragged her lovely and truly amazing friend along for one eventful day of fun. Firstly, it has been many years since I have done anything like this. Back when I was a teenager, I would think nothing of staying out all day in all sorts of weathers to meet 911 or 5ive to get the perfect picture with them. One time in particular, we got the first train to London and queued all day to get front row tickets for a special 5ive concert when I was just 15. How did we do this? I chose to make my travel plans to the big smoke the night before. I got on the train listening to the Fifty Shades soundtrack. By the time I got to my friends address just outside London it took me 3 hours, and the clock was ticking. I needed sleep and I knew I wouldn’t get much knowing we had to get up early. I got informed by some forums that we really needed to get to Leicester Square for about 8am or even stay overnight (Sorry, This is none negotiable Mr Grey, this will not be happening, please remove this from the contract). We decided to leave my friends at 8.30, which meant we would be in the Square for 9.30. To be fair I was very worried about the amount of people who would turn up. This film had many fandoms attached to it. Twihards, Jamie Dornan fans, and of course just us crazy woman. May I add at this point, I do not like Twilight, Maybe it’s my age, but Robert Patterson doesn’t do it for me. Thankfully it wasn’t as busy as we thought, and we got a wrist band easily. After leaving the craziness of the all nighters, we were hungry and in need of some good food! We hit up The Diner just of Neal Street. I had the Lumberjacks breakfast of pancakes, bacon and eggs. My partner in crime had the breakfast Burrito. If you ever want a true taste of an American dinner, these bad boys are the where to go! With food in our bellies, and a trip to the Moomin shop, and a stop off at the pub, we were ready for the fun of the premiere. We got informed to be there for 12pm, but in fact we didn’t need to be there till 3pm when the gates opened. The great thing about any event like this is the people you meet. Everyone was there for their own reasons, but we all bonded with our love for Fifty. What happens next in these crazy events is they call out your wrist band numbers (e.g. 1 – 50, 50 – 100 etc). With the rush of adrenalin we ran to the best spot possible. Sadly the first 100 got front row, but second row wasn’t too shabby. The waiting was the hardest part, and lack of drinking water. I got cramp in my legs like nothing I have ever felt before, with this and the cold, I realised I am too old for this! When finally the show kicked off at 5.30pm I was ready for a strong drink and some hot food, but I knew I had to keep going to see Mr Grey. When the stars finally did come out, the rush was worth it. Seeing my friends face when Aaron Taylor Johnson appeared next to her face was priceless. We got to meet most of all the cast, the only one who didn’t get close enough to us was Mr Grey himself, which I wasn’t too disappointed in the end, as Dakota Johnson stole my heart. She was so sweet and beautiful, unlike Jamie Dornan she seemed to really love every moment of it. I think anyone who was going to take this role on, should of known the hype it would attract. Don’t get me wrong, Jamie looked smoking HOT, Maybe I was just a bit sad I didn’t get to see him close up. We could have waited longer, but after some rude full time autograph hunters in front of us, it was time to get the hell out of there! It was cold, and we were in need of chicken wings and beer! Here are my top 5 tips if you want to brave a premiere. 2. Screw staying overnight! There is loads of room around the barriers; I wish I had a later number now. A girl I made friends with had 190 and got front row, where I had 105 and got second row, because they opened more barriers up. She met everyone! 3. Remember your phone needs to be charged for photos. Yes I know we all want to tweet and facebook where we are, but remember you need it for the stars. Or just bring an old camera like me! 4. Keep warm/ stay cool. In the winter wear thermal EVERYTHING! My feet felt like they would drop off! Even though you don’t want to drink because you may need the toilet, you need it! Water stops cramps and keeps you hydrated. You will feel better, Trust me! 5. Have fun, but watch out for the professional Autograph hunters. They mean business. Would I do it again? Well I would, but never in the winter! I enjoyed it up till the girls in front of me were rude, then the fun stopped. I am too old for hostility and what was worse, I was a real fan of the books and they were just autograph hunters.